We stock a huge range of classic and contemporary living room furniture from a variety of top class manufacturers so you can relax, chill out or formally entertain guests in your home. Whatever the mood and style you wish to create we can help you. Our living room furniture ranges are manufactured to the highest standards and are beautifully made, are a little bit different and made to last. All of our furniture is chosen because we simply love it - experience tells us if we love and desire it so will you. Latest Additions: FF Collection by Tetrad ultra contemporary fabric sofas and chair, Charltons Somerdale living room furniture, Jay-Be sofa beds, Artistic Upholstery bespoke sofas and chairs, rugs and floor coverings, bedding and throws and classic Tetrad fabrics and leather sofas and chairs. We offer competitive prices for all our customers, unrivalled customer service and free home UK mainland delivery, should you find a high street shop or online retailer offering the same goods for sale we would appreciate the offer to price match. Take a look online at what we have to offer. Any questions just call or email us - we're here to help. If you are local or fancy a trip to sunny Southport to visit us in person, we have a fabulous selection of living room furniture on display in our showrooms especially Tetrad as we are an accredited and official Tetrad Studio. We love Tetrad! We are an accredited and official Tetrad Studio and stock all the Tetrad Heritage and FF ranges, with a large selection on show in our Southport furniture showrooms. We have Tetrad leather sofas, Tetrad chairs, Tetrad mixed leather and fabric sofas and chairs, Tetrad fixed cover sofas, Tetrad loose cover sofas, Tetrad contemporary sofas, Tetrad Classic Velvet sofas and armchairs, Tetrad cushions and Tetrad footstools. Whether you are after contemporary Tetrad including the FF Collection or a more classic look like the Tetrad Eastwood or Tetrad Alicia sofa we've got the lot and we're not afraid to say the word TETRAD! FREE delivery! Click on the link or image above to see all the Tetrad furniture! We have a wide range of Country House and URBAN contemporary and vintage upholstered living room furniture with lots of contemporary on trend linen and neutral fabric sofas and chairs, contemporary Italian leather, a contemporary twist on leather and fabric Chesterfields, contemporary easy chairs and armchairs and some retro mid century pieces for your delight. On the classic vintage side we've got leather Vintage and Chesterfield sofas, chairs and stools. 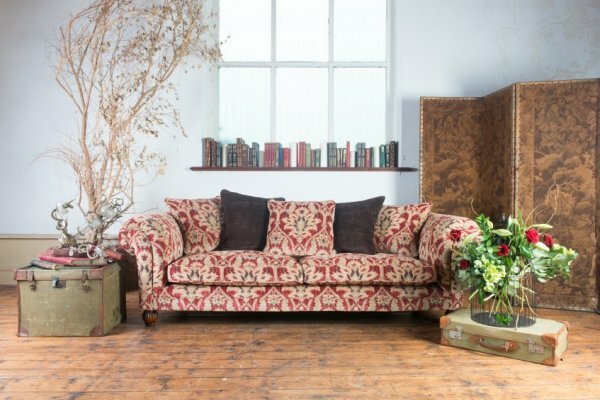 We also have a large range of classically styled fabric sofas. FREE delivery and a lot of these are in stock for quick delivery! Click on the link or the image above to view the collection. Artcopi specialise in handcrafted living room furniture made of solid cherry or oak woods. French furniture at its best! Simply glorious designs. Artcopi take their inspiration from French cabinet makers in the Directoire, Empire, Regency and Louis Philippe periods. At Harvest Moon we offer all the Art Copi ranges including: Artcopi Amboise, Armance, Tanais, Les Composables, Vendôme and Les Varennes. Pieces include a wide range of chests of drawers, bookcases, writing desks, entertainment storage furniture and occasional tables. FREE delivery on all Artcopi orders over £1000! Click on the image or link above to see the Artcopi furniture ranges. 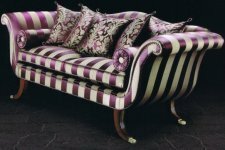 Artistic Upholstery offers the finest English bespoke upholstery handmade to order including bespoke sofas, armchairs, sofabeds, day beds, chaises, occasional chairs, ottomans and footstools all handstitched including any valances and bullion fringes. Artistic Upholstery furniture is available in any of the traditional or modern upholstery fillings and finishes. Most pieces are available in a range of leather and fabric options or customer's own materials can be used. Click on the image or link above to find out more. Our throws range includes white, cream, ivory, beige, blue, brown, black, taupe, silver, grey, orange, red, aqua and heather throws. The throws are made from cotton, wool, linen, faux fur, mohair and velvet. We have a selection of both plain and patterned classic and contemporary designs including tartan, scallop edged, shell, animal print, heart print, striped, chevron, cable knit, tufted and more designs. Click on the image or the link above to view our throws range. The latest rugs including plain and patterned rugs hand picked for you by us. The range covers a selection of contemporary rugs including natural hide rugs, spectacular Matador patchwork cow hide rugs and a hand stitched crewel rug plus also classic patterned rugs. Why not finish off your new interior with one of these stunning rugs? .... think VOGUE... KELLY HOPPEN ... ideal floor coverings for any home. Click on the link or image to view our rugs and floor coverings. 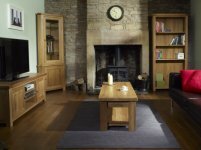 Our Bronx oak living room furniture is simply gorgeous contemporary solid oak furniture. Yes, we did say solid oak and all at prices you used to pay for pine! The Bronx oak living room range includes a wide range of oak occasional tables (coffee tables, nest of tables, hall tables, lamp tables etc), a selection of home entertainment storage furniture, open and glazed bookcases including a HUGE library bookcase, chests, sideboards, desks, a range of mirrors and MORE..
Click on the image or the link above to view the Bronx oak living room range NOW! At Harvest Moon we stock both of the Charltons Furniture living room furniture collections. The Charltons Bretagne is a modern oak furniture collection with a range of oak tops and you can choose a painted finish option or leave the whole piece unpainted. The Charltons Somerdale is an oak plain or painted with plain tops living room furniture collection with a modern twist on a traditional design. 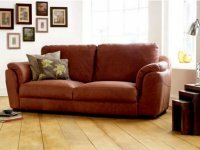 FREE delivery on Charltons living room furniture orders over £1000! Click on the image or the link above to view the Charltons living room furniture range. The Parisienne furniture range is a unique range of classical French, provincial style, white painted furniture and is for everyone who has ever dreamed of being a French princess or marrying one. This fairy tale living room furniture collection has many traditional features, including hand-carved details and individual hand-finishing with a seven-step colour and ageing process to create a fabulous authentic finish. Range includes bookcases, display cabinets, benches, coffee tables, mirrors, sofas, comfortable chairs, chaise longues and more occasional tables. Click on the image or the link above to view the Parisienne living room range. FREE delivery! HUGE choice of Country House living room furniture collections including contemporary, modern and classic leather and fabric sofas and chairs and all other contemporary living room and occasional furniture. Also antiqued oak, Santiago silver, Nailsworth birch lime washed, Parisienne white, Cannes, Empire, Florence, Vintage Style, Montmartre, Swedish white painted and Oriental painted ranges, Bronx oak, Marseille and Gilt classic French and Wessex weathered oak living room furniture. 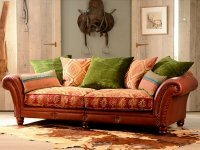 Plus also Maharaja leather furniture, mirrored and other glass furniture, driftwood occasional furniture, throws and rugs. FREE delivery! Click on the image or link above to see our collections. Beautiful new reproductions of the famous "Collinson Rocking Horses" made by J. Collinson and Sons of Liverpool since 1836. Entirely hand crafted rocking horses to the original rocking horse patterns and style by English Craftsmen. 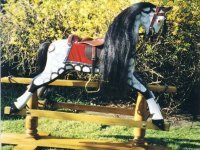 Two sizes of rocking horse in either hand painted or natural polished wood finishes. All our rocking horses come with real horse hair mane and tails, leather saddles and tacks, brass strirrups and fitments. Come and see our rocking horses in store. Full rocking horse restoration service also available. Click on the image or link to see our rocking horses. 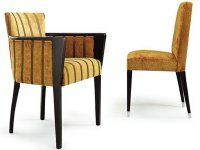 Fabulous traditional and ultra modern Collinet Sieges French chairs, armchairs, club chairs, occasional chairs and sofas in antique wood finishes, lacquers or traditional finishes. The Collinet Sieges seats can either be rushed, caned or traditionally upholstered. At Harvest Moon we offer the following Collinet Sieges Living Room ranges - Moderne, Club, Style and Classique chairs / sofas and a sofa range. A bespoke furniture service also available for interior designers. Click on the image or link above to view the Collinet Sieges living room chair and sofa range. The latest Concept memory foam sofa beds, sofas, chair beds and chairs are now available at Harvest Moon. The Concept memory foam sofa bed range of 10 different models are easy to fold out and come in LOTs of different plain fabric or patterned fabrics or faux leather options. The Concept Memory Sleep memory foam sofabeds range can help reduce back pain, headaches, stiff necks and painful hip Click on the image or the link above to view the Bronx oak living room range NOW complaints compared to conventional foam mattresses and seating. Made in the UK! Click on the image or the link above to view the Concept sofa beds, sofas and chairs. Our Wessex weathered oak living room and study furniture includes bookcases, chests, classic writing, pedestal, partners and kneehole desks, a sideboard, filing cabinets, occasional tables, seating and mirrors. Our favourite piece is the new huge Wessex weathered oak library bookcase which comes complete with a ladder. Click on the image or the link above to view the Wessex weathered living room range. Le Fablier living room and occasional furniture - the finest Italian furniture all handcrafted in Italy from the finest European hardwoods in classical, retro and contemporary furniture designs. We have ALL 12 Le Fablier furniture ranges: Le Fablier Aurea, C'era una Volta, I Ciliegi, Fiordi Pesco, Le Gemme, I Lauri, Modular System, Mosaico, Mosaico Modular, Le Ninfee, Oasi and Le Primule furniture. The range includes occasional tables, chairs, display cabinets, bookcases and lots of modular storage furniture systems in a variety of different hardwoods. FREE delivery on all Le Fablier orders over £1000. Click on the image or the link above to view the Le Fablier furniture range. Our Florence living room furniture includes the huge open library bookcase with ladder shown above, several other bookcases, occasional tables, display cabinets, sideboards, desks, a bench and several mirrors. This is a French inspired contemporary range featuring simple clean lines. The Florence living room range is available in a painted cream, painted grey or black lacquered finish so there is plenty of choice for you when designing your style for your home. Click on the image or the link above to view the Florence painted living room range. 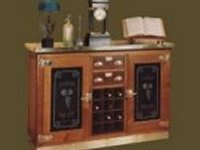 Felix Monge Furniture make fine hand crafted reproduction Parisienne furniture based on 14th to 20th century designs. All solid wood oak and cherry furniture available with different patinas. We have selected a few pieces from the Felix Monge Artisan, Charm and French Bistro / Bar / Cafe furniture ranges. Our choice covers several reproduction 19th century pieces - a French Clerk's drop front bureau, naturalist display cabinet, a cafe / bistro sideboard, mirror and bar stool, a liqueur cabinet, large library bookcases, chorister's table and Louis Philippe and Directoire "glass of water" tables. Plus from the 20th century confectioner's furniture. FREE delivery! Click on the image or the link above to view the range. We offer ALL the ranges in the Sofa Collection by Forest Sofa which encompasses fabric sofas and chairs, Premium leather sofas, sofabeds and chairs and Vintage leather sofas including Chesterfields, sofabeds, armchairs and office chairs. Lots of different sizes! 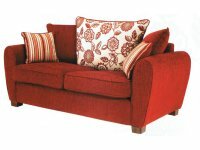 From 1.5 love seat sofas up to 4 seater sofas and in all 1/2 sizes in between! Also regular and large sofabeds and modular corner units. All Forest Sofa pieces are handcrafted in the UK with a short lead time of only 4-6 weeks and FREE delivery. Click on the image or the link above to view the range. LOTS of different French style furniture collections all in one handy place for you! The ever popular Cannes white painted distressed furniture, Parisienne French provincial style white painted furniture, Florence painted furniture, Montmartre outlandish black painted furniture, Marseille and Gilt classical French furniture and more! Choose from 6 different luxury fabric sofa beds including classic, modern and retro sofa beds, a retro sofa bed chair and a footstool bed. Each model is available in luxury woven fabric with 20 colour options. Rolls Royce of sofa beds - suitable for everyday use- no need to buy a bed and a sofa. FREE 2 man delivery including assembly. We now have our Country House and URBAN library bookcases and large bookcases in their own section including large glazed bookcases, breakfront bookcases, open bookcases, double, triple and corner large bookcases. Styles and finishes range from traditional reclaimed pine library bookcases to a contemporary Chelsea black / chrome library shelves unit back to French painted library bookcases. Direct from the Orient our Oriental living room and occasional furniture is based on original Chinese classic antique furniture designs. All pieces are hand made from hard wood and are fine example of Chinese black lacquered furniture with a gold leaf edging and antiqued style hammered fitments. Our Oriental furniture range includes a hall table, a glazed bookcase, cabinets and also Chinese painted patterned chests in a variety of colours. FREE delivery! Click on the image or link above to see the Oriental furniture ranges. Oak, pine, ash, birch and elm furniture ranges all handily placed in one place for you to browse around. Lots of ranges including Cannes white painted distressed furniture, Nailsworth light grey lime washed birch Georgian style furniture, Empire reclaimed pine furniture, Wessex weathered oak furniture, antiqued oak furniture, Country ash, elm and oak furniture, driftwood occasional furniture, rustic pine furniture, Natalie hard wood and upholstered living room furniture, Kentish contemporary oak furniture, our favourite the Bronx solid oak range and more. FREE delivery! Click on the image or link above to see the lot! NEW all together our favourite painted furniture collections including Cannes white painted distressed furniture, Parisienne white painted furniture, Courchevel antique white painted furniture with oak tops, Swedish white washed furniture, Montmartre black painted furniture and more from Country House and by Charltons Furniture the Bretagne collection. 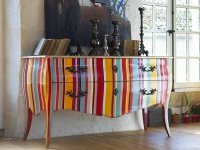 The Parisienne furniture collection is a unique range of classical French, provincial style, white painted furniture with designs from the Louis XIV to Louis XVI eras. FREE delivery! Click on the link or the image above to view the painted furniture collections.